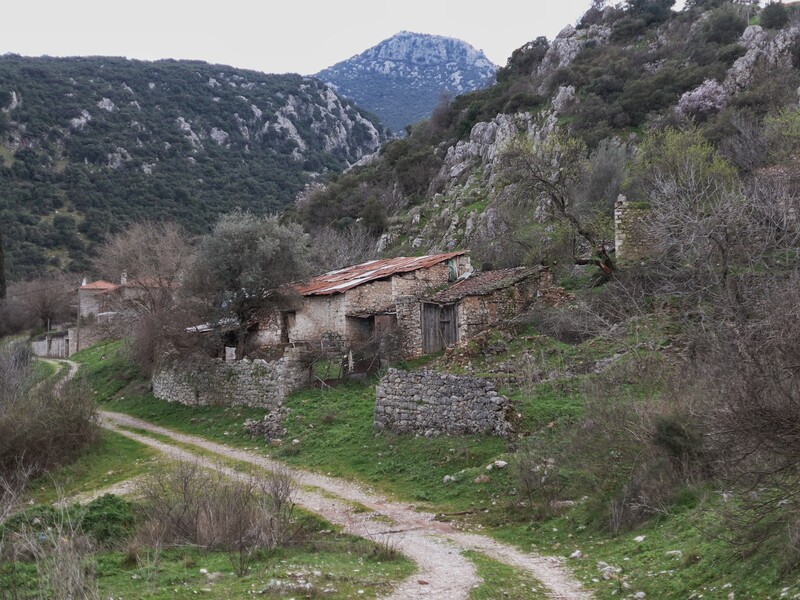 Last weekend we visited a little village on the northern slopes of Mt. Parnassos, thanks to a generous invitation from Sue’s cousin to stay at the house he’s built there. Parnassos is the huge mountain we see to the north, looking straight off of our balcony in Sykia. 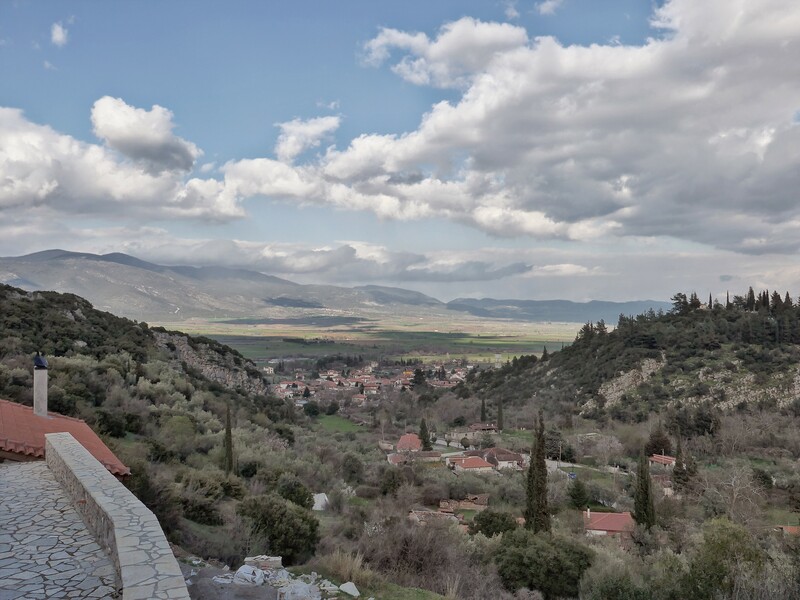 If you followed that line north, you’d arrive first at Delphi, then you’d cross the top ridge of Parnassos, and finally descend the other side to Mariolata, about 45 miles away. Of course, the Gulf of Corinth is a big part of that 45 miles and, without a plane or an amphicar, it took us 3.5 hours to drive around the Gulf to his house. Sue’s cousin built in the upper part of the village, at about 500 meters, and enjoys this spectacular view of Mariolata, and across the Kifissos valley to Mt. Kallidromo. 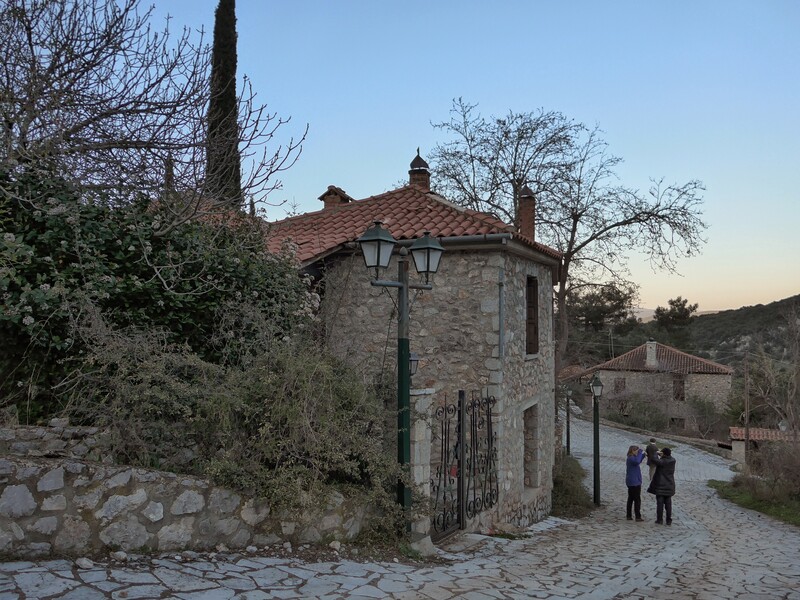 Mariolata traces its history back to ancient times and, after the Persians slaughtered the 300 Spartans at Thermopylae, it was one of the villages they destroyed on their way down to Athens. Ancient ruins can be seen in the town today. 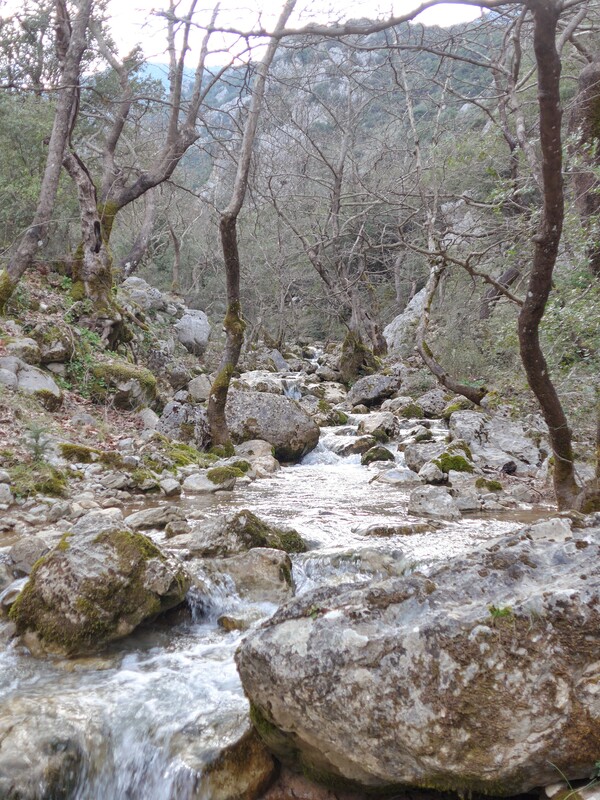 Until about 1960, Mariolata was sited up on the mountainside in a deep gorge served by a lovely mountain stream. That’s when Mother Nature dealt Mariolata another savage blow, turning that stream into a raging torrent that destroyed the village again. The government provided the village funds to rebuild, and the villagers decided to move the village out of harm’s way, down to the valley floor. 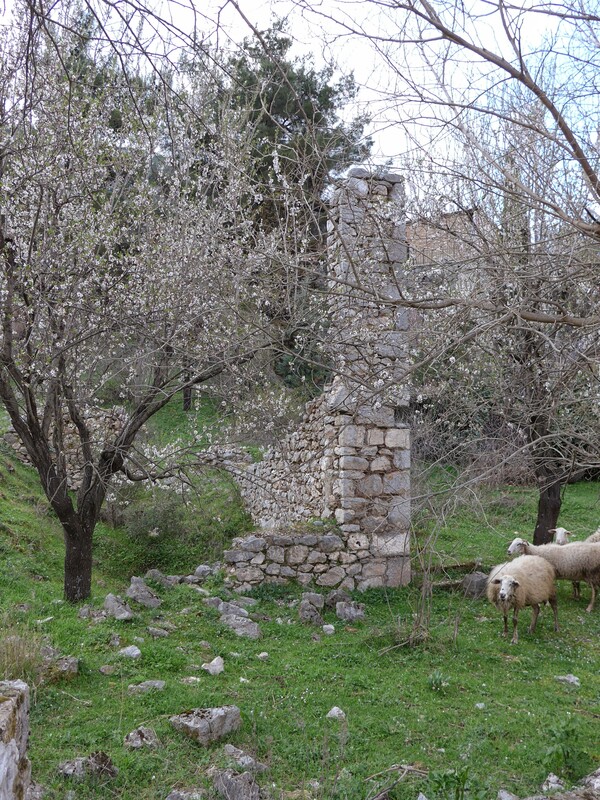 Remnants of the old village can still be seen on the mountain side. This old house is now used as an animal pen. New arrivals in Mariolata, including Sue’s cousin, have built up on the mountainside but well clear of the gorge that flooded. 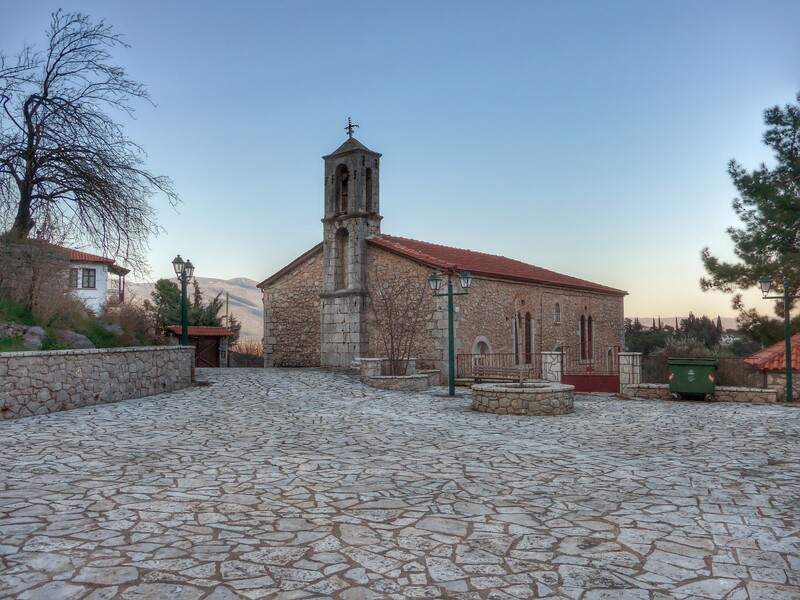 The upper part of the village includes this pretty plateia and the church of the nativity of Mary. That feast day is September 8, and Sue’s cousin tells us the entire village treks up the mountainside to participate in the celebration. One of the great joys of visiting the village is taking advantage of the opportunities it offers to walk in the countryside. 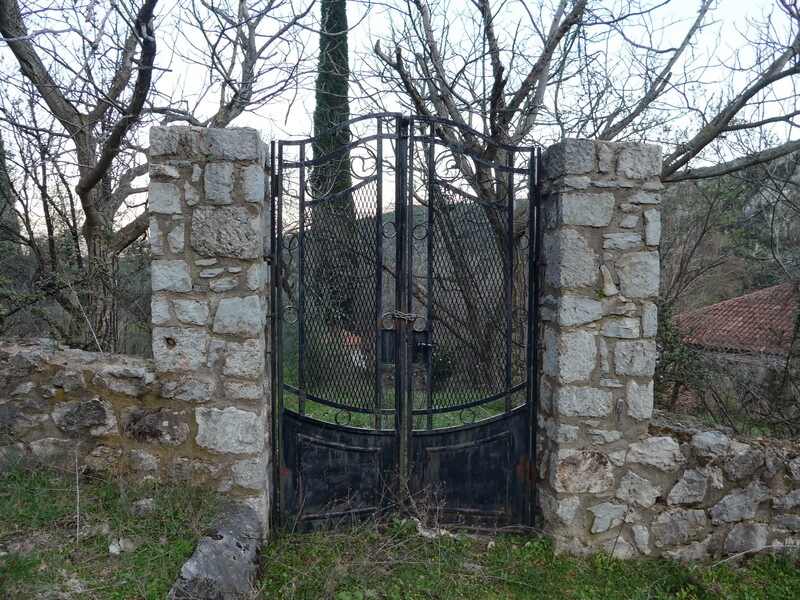 This nice gate encloses a vacant lot, the house, I suppose, having been relocated below. Spring was just beginning when we visited Mariolata, and there were wildflowers blooming all along the roads and footpaths. 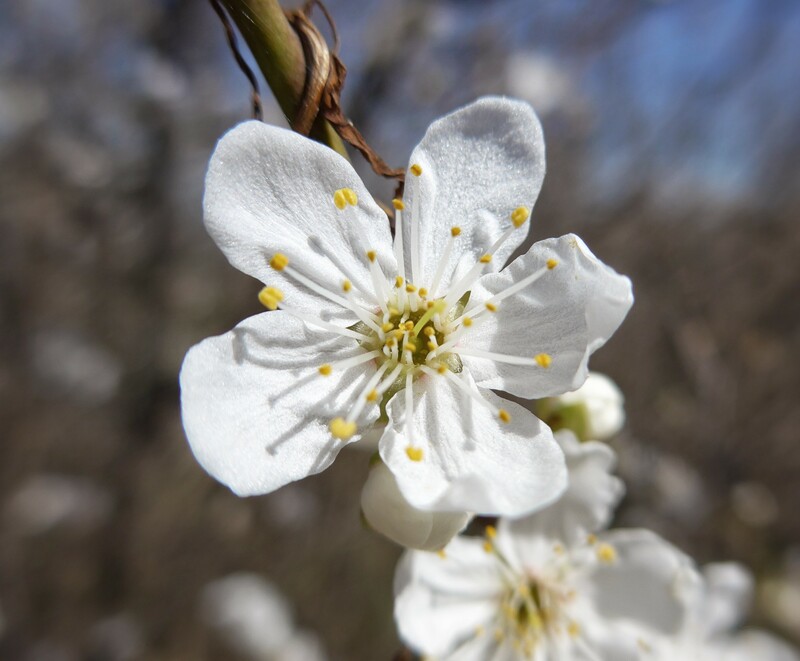 We were especially happy to see the almond trees blooming. Sue’s cousin took us to an abandoned monastery, high up the mountain on a forestry road (I’d estimate the altitude at about 700 meters). 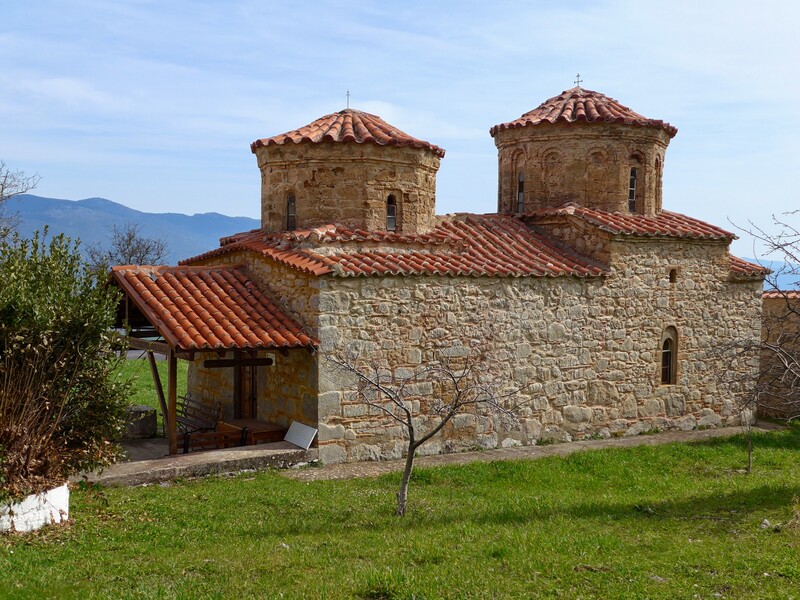 The monastery’s church, dedicated to Mary “Queen of All” (Pantanasa), dates to the 15th century. 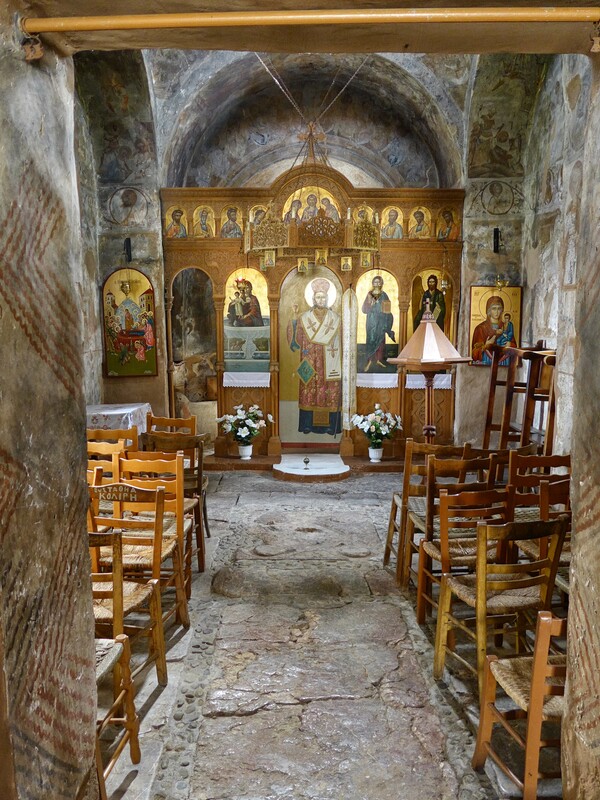 The interior is completely covered with period frescoes, which were badly damaged in 1942 when occupying Italian troops shamefully set the church ablaze. The church is unusual in that it features two domes. At first it appears that the church was built in two phases but indeed it was intended to have double domes from inception. 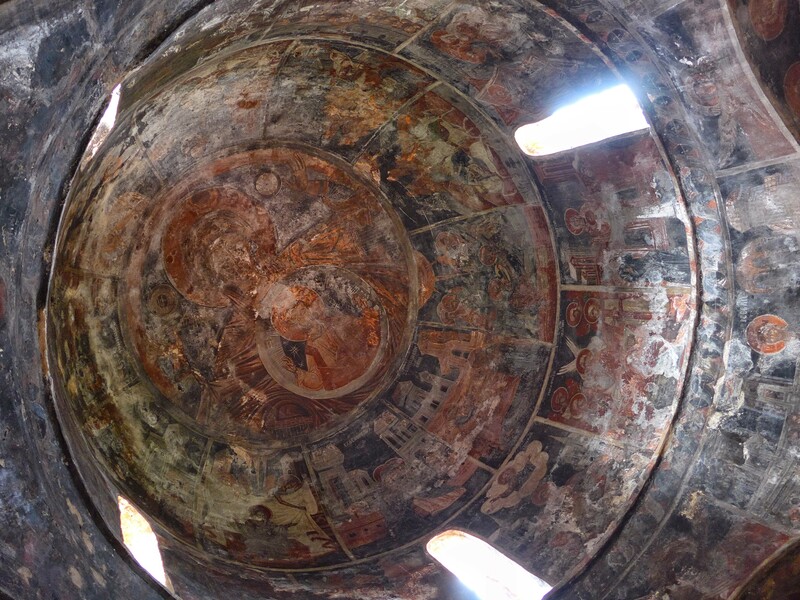 In this photo, the lower dome’s central fresco depicts Mary Pantanasa and the other dome, above the nave, depicts Christ Pantocrator, the usual subject of orthodox domes. 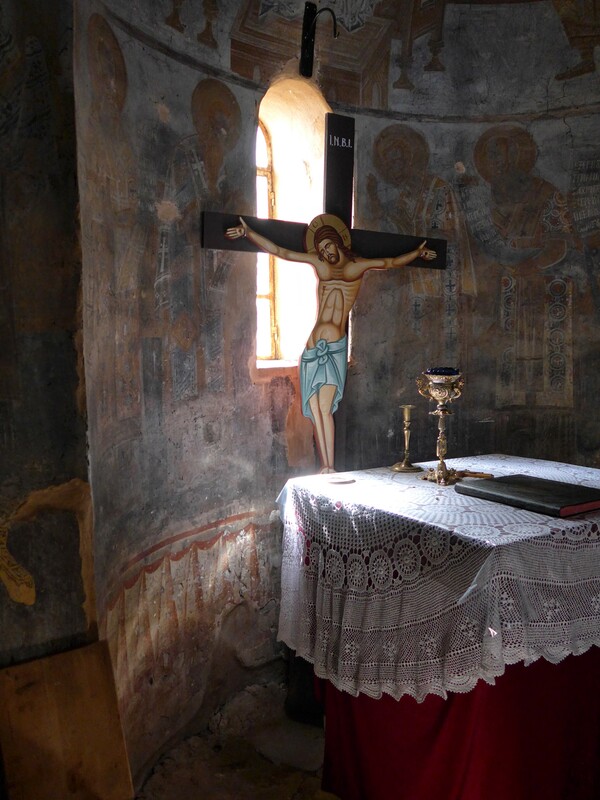 I peeked through the open door of the iconostasis, and found sunlight streaking through the slit window in the sanctuary. There was no snow at the elevations we visited although plenty was visible along the summits and high ridges of Parnassos, and meltwater was streaming down the mountainside everywhere. One night the temperature dropped to freezing, reminding us that snowfall is a regular feature of winter in the village. Mariolata is one of a string of 4 villages along the road that skirts the big mountain on its northern flank. Sue’s cousin showed us all of them, each prettier than the next, and gave us the opportunity to sample the region’s food and wine as well. It was the ideal way to say farewell to winter while spending precious time with our family. Lovely post. The photos are poetic. I cannot wait to return. Thanks, I’m glad you liked it. We can’t wait to travel with you again.